A desktop you can change, customize, and update. The Daily Shelf, which spreads across the bottom of the screen. The Keep Reading menu, which is a small ribbon at the very top. Media shortcuts at the bottom. You can get back to the Home screen from anywhere by pressing the Π button on the front of the device. The Home screen is subdivided into three panels you can use in most any way you want; only one of the three is active at a time, but the other two are waiting in the wings. You can drag and drop a book, magazine, newspaper, or document to any one of the panels if you want it immediately available for tapping. Which of the panels are you looking at? Check the easily overlooked panel indicators at the top of the screen. You’ll see three small circles. The solid white circle shows which panel is active; the other two panels, available but not active, are shown as an open circle. To move from one panel to another, swipe your finger left or right across the screen. Tap the icon for the item. A desk can be a pretty scary place, with piles of paper from each of the half dozen or so projects. Don’t let this happen to your Home screen. Organize and rearrange items. The item is no longer shown on the Home screen, although you can get it if you burrow down into the stacks of your NOOK Tablet Library. Stack. You can make your own pile of books, one on top of another. Just drag covers or icons on top of each other . . . up to a point: You can’t completely hide any cover. Grid. If you want the tablet to automatically arrange all the covers in a neat grid, just double-tap any open area of the Home screen. 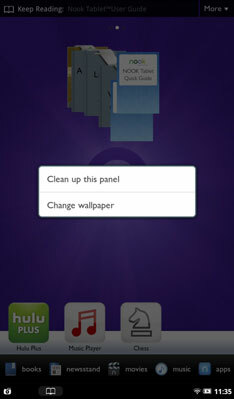 Press and hold a part of the wallpaper in the panel you want to clean up. Tap Clean Up This Panel.